Back in mid 2013, I launched my ‘end of life’ business, Sacred Hunger, just hoping it was possible to even run an ‘end of life’ business! 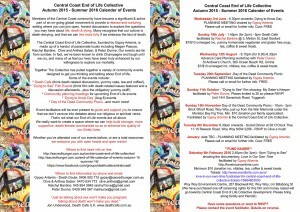 I started with a Death Cafe which was a great success, and then a 3 week workshop called “Dying To..enhancing life by exploring death”. It too was a hit. 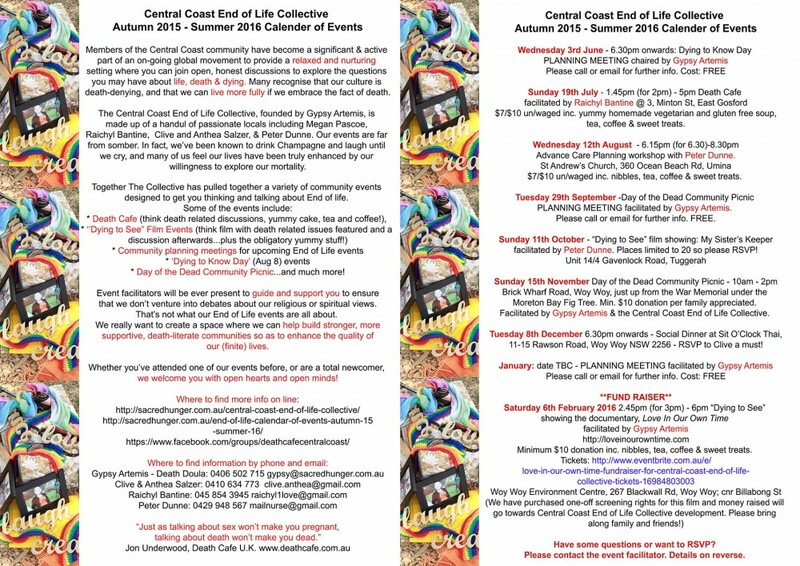 18 months on, we have what I believe must be one of the most active ‘end of life’ communities in Australia, from which I am pleased to say, the Central Coast End of Life Collective (CCEOLC) has been born! Essentially, we are a group of people who are passionate about social change around ‘end of life’, who care enough to do something and to help lead other community members to grow through learning and exploring end of life issues. The group is non religious, however, we of course have our own individual spiritual and religious beliefs, as does everyone. These are not, however, pressed pun others. So what sort of people attend our events? We come in all shapes, sizes and ages! I think it’s safe to say that many of us probably wouldn’t naturally come together for anything other than theses events – our passion for and interest in ‘end of life’ is the common ground – however, I cannot deny that many of us have developed lasting personal friendships that now extend beyond ‘end of life’. Would you like to get involved and join The Collective? that you ‘fit’ with the group. We’ve got a good thang going on, and it’s important that we nurture and maintain the equilibrium and connectedness of the group, by welcoming others who have similar values, commitment, etc. There is currently no “membership fee”, however, I suspect we will soon arrive at a point where a small financial contribution is exchanged for exposure via publicity and related websites etc. And in closing, here’s our current calendar of events.